Water is life! That is the cry that was repeated when Kandi Mossett finished her keynote address at the Local Environmental Action Conference last Sunday. 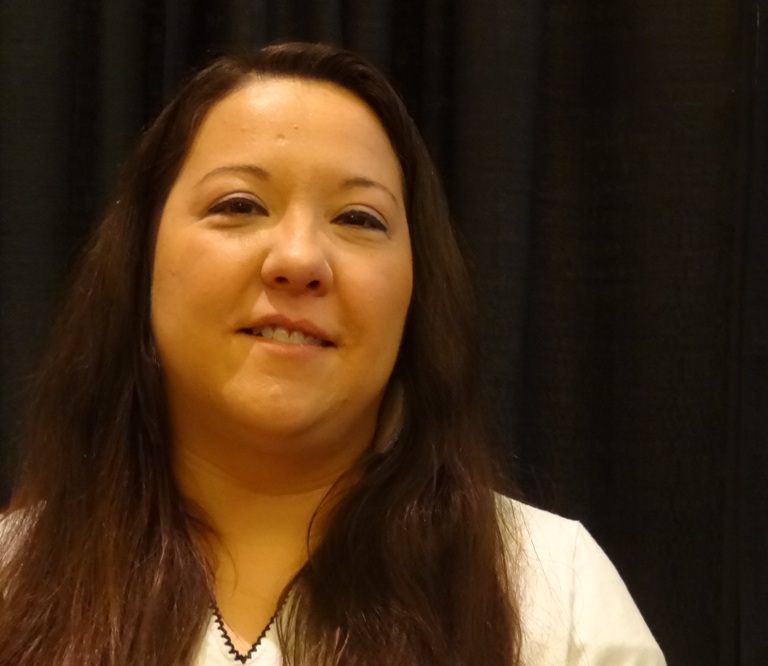 Mossett, of Mandan, Hidsata and Arikara tribal heritage, is a leading voice in the fight to the impacts that environmental injustice are having on indigenous communities across our country. We all know about the stand taken at Standing Rock in North Dakota to keep an oil pipeline from crossing sacred lands and under the lake that supplies water to the tribe, threatening the safety of that water supply. The protest has gotten a lot of press over the past months, but Mossett filled us in on the terrifying context and damage done to land and water over past years. Oil wells and fracking have been going on for years. One result is that contaminated fracking water has been trucked to manmade ponds that are not reliable and have leaks. These spills kill plants and soil. One farmer’s whole field was destroyed. The river where people fished turned blue, signifying a deoxygenating algae bloom that killed the fish. Mossett showed us a photo of 18 inch ‘frack sox’ filter. These are radioactive and not disposed of properly, and sometimes are picked up by children. Babies are affected by the hydrogen sulphide poisonous gas. The idea that the Standing Rock protest is just about the building of a pipeline does not begin to tell the story of lands taken, soil and water already contaminated, and health consequences of fracking. Mossett herself is a cancer survivor. Mossett continues to fight for justice for indigenous people and you can find more information at the Indigenous Environmental Network http://indigenousrising.org/KandiMossett. 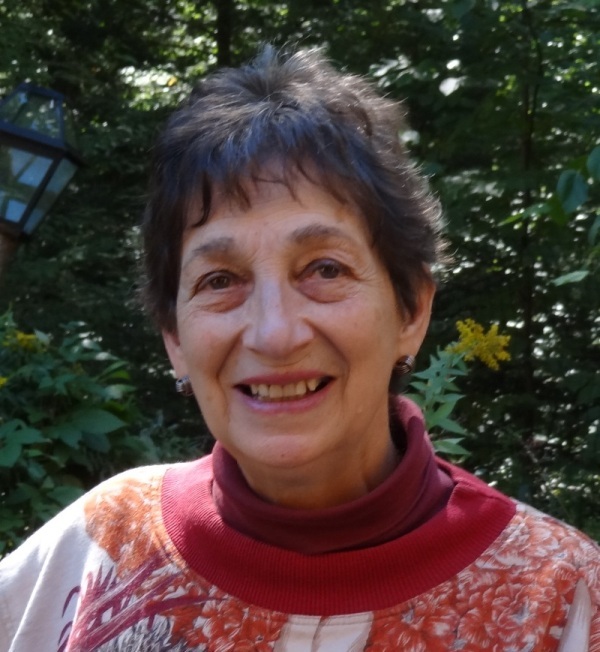 In the afternoon Lois Gibbs was the keynote speaker. In 1978 she founded the Love Canal Homeowners Associate. Happily, more than half of the audience understood instantly what that meant. When Gibbs, who had a toddler son, noticed that many children in the neighborhood were becoming ill, she investigated and found that the school and the neighborhood were built on a toxic landfill. She and other parents attended town committee meetings and asked them to do something, confident that this information would move them to action. But nothing happened she said. No action was taken. She went to the town again, but their decision was based on a cost/benefit analysis of the neighborhood and the earnings of the 100 or so families living there. Earnings of men and their sons were calculated over the years, but women and daughters were not considered to have any earnings and were worth nothing. “Can you imagine? The women were worth nothing?” Gibbs said to her audience. Gibbs’ group then turned to science and created a survey that showed that 56% of the children had birth defects, counted the number of illnesses and miscarriages. Their study was dismissed as ‘useless housewife data by people who have a vested interest.’ The town finally did their own study and got the same information but declared that this was simply a random cluster of genetically defective people. Then Gibbs said they misbehaved. They got town officials to come to a meeting at her house for more discussion and served cookies and coffee. Then we told them they could not leave until they promised to do something to remove all the families and give them new homes. “We held them hostage.” The men made phone calls, one of which brought a sharp shooter to keep watch through the window. After 5 hours they said they would work something out. But Gibbs and her group told them they if they did not have a plan in place by Wednesday at noon, three days hence, they would be very sorry. The media was told of the deadline and there was great tension, but exactly at noon on Wednesday it was agreed. By a month later many of the families had been evactuated and the rest followed soon after. Gibbs’ toddler daughter who was conceived and born while they lived at LoveCanal had been extremely ill through all this, but she said her daughter and her son were fully recovered after two years living elsewhere. Her daughter has even given her three healthy grandchildren. Gibbs’ advice was that people who want to bring about change need science and the law. She said to fight politically, never violently and always to stand together. I did not to attend the workshop about Flint Water because we are fortunate in Greenfield to have good clean drinking water, and a town website with water and sewer divisions. Water testing results are posted there. I did attend Dirty Water: Increasing Community Capacity in the Face of Drinking Water Contamination with Emerging Chemicals. The emerging chemicals we focused on were polyflourinated water contaminants like PFCs, PFAS, PFOA, etc. These are chemicals that can spread through the soil and get into water systems from factories. Testing is difficult and expensive, they cannot be boiled away from drinking water like bacteria, and they can be absorbed through your skin from upholstery or carpeting materials, and by bathing or taking a hot shower which will allow you to inhale the chemical. The workshop did not solve any problems, but pointed out the problems that need solving. 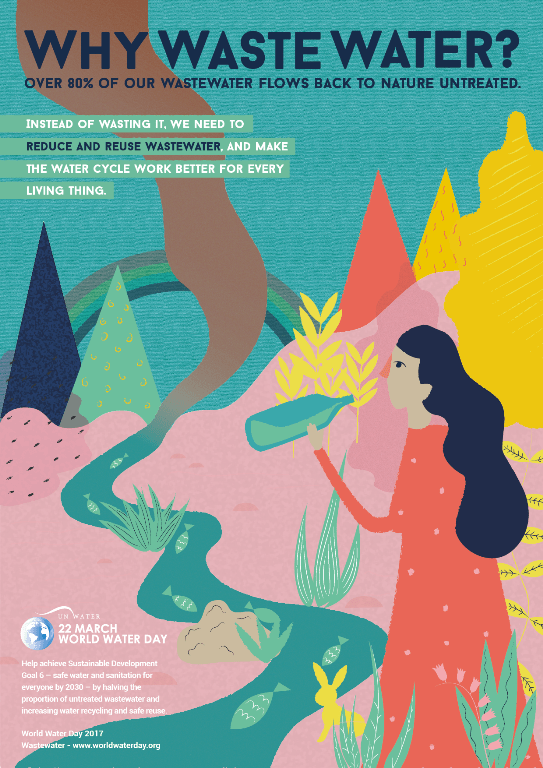 Water is Life! We must guard and protect our nation’s water supply. Toxic Actions and Massachusetts Climate Action Network hosted this excellent conference. We just returned from a trip to Texas where our daughter Kate Lawn lives outside Houston with her family. 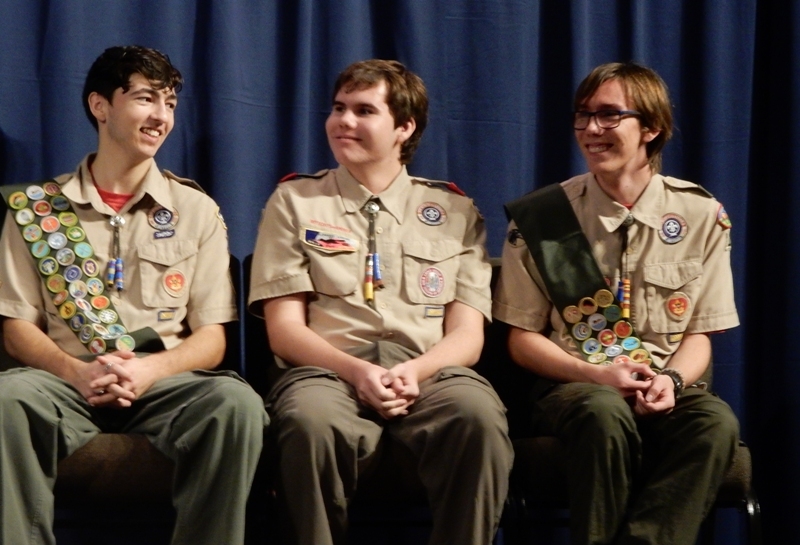 Her family now includes three Eagle Scouts, dad and the two boys. Two years ago we visited and attended Anthony’s Honor Court; last Sunday we attended Drew’s Honor Court. We were so glad to celebrate their achievements. One of the elements of the ceremony was a slide show of Drew’s scouting years beginning as a Tiger Cub. 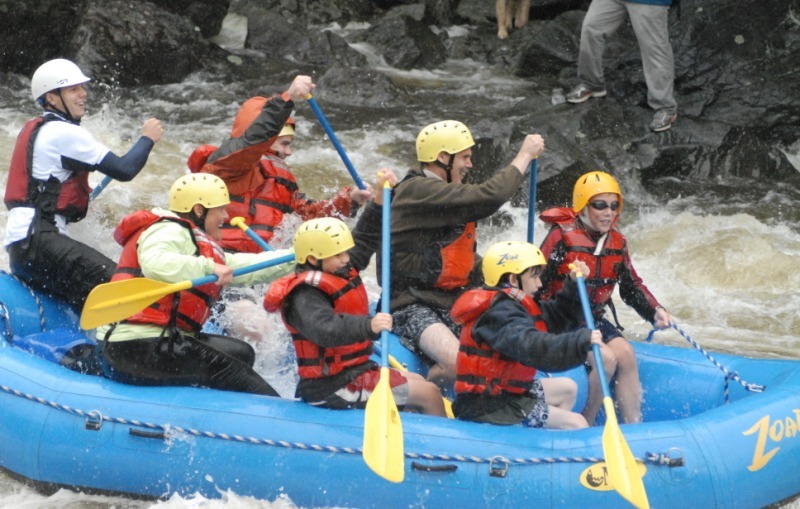 We saw Drew at campouts, hikes, rafting and even scuba diving. It struck me how often water was involved. Drinking water had to be arranged for campouts, streams were crossed on hikes, and for those water sports the boys had to be in the water. They had to learn how to swim of course, and they needed to know the importance of safe drinking water, and water safety when in the water. It was wonderful to watch this record of his growing up, of his participation in Scout projects, and in Scout projects in the community. I was especially happy to see that his required Eagle project was planning, organizing and building a tiny free library for children that now lives in the Town Hall where parents and children can find a book to entertain themselves while business is attended to. They can even take the book home because the sight of the tiny free library has generated donations from others. As part of our celebratory visit we took a family trip to Houston and the historic Cistern in the 160 acre Buffalo Bayou Park, an area that is once again becoming an active waterfront with hiking and bike trails, a dog park, native plantings, the resurrection of a Lost Lake and pontoon boat tours that travel into the downtown area on the bayou. Part of the renovations include flood abatement measures. 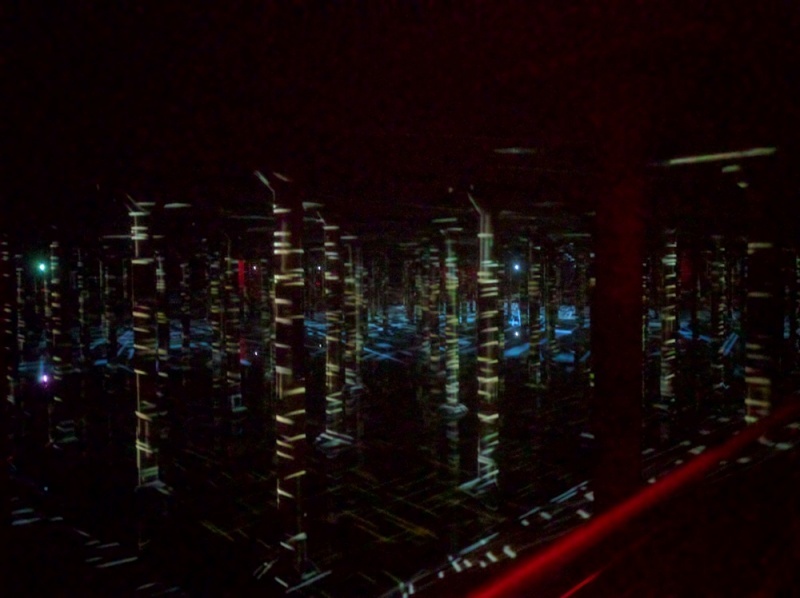 Un-Houston-like temperatures were in the 40s and windy so we didn’t explore the whole park, but we did attend the video art installation called Rain: Magdalena Fernandez in the Houston Cistern. The Cistern was one of the city’s underground reservoirs and was built in 1926 for fire suppression and for drinking water. This 87,500 square foot concrete space has 221 elegant concrete columns that are 25 feet tall. At full capacity it holds 15 million gallons of water. It operated for decades but an irreparable leak forced the city to close it in 2007. It still has a low level of water in it. Fortunately for us the Buffalo Bayou Partnership saved it and has turned it into a venue for art installations. 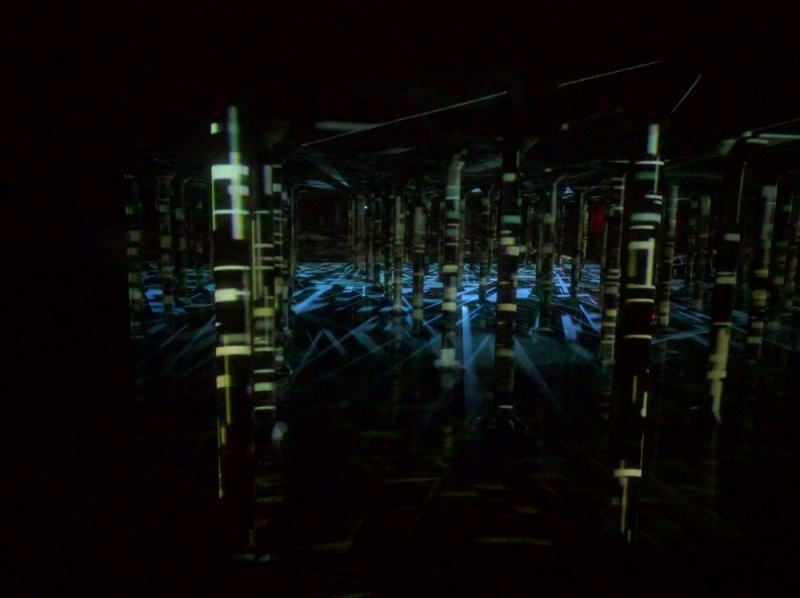 RAIN created by Magdalena Fernandez uses the Perpetuum Jazzile vocal group, using only body percussion to create the sound of rain, soft and torrential, using their snapping fingers and slapping hands while lights flash and move among the columns. We entered the Cistern with a guide who prepared us for the deep dark and the occasional loud booms that reverberated in my chest interrupting the splashing sound of rain from time to time. It was a mysterious experience. When we flew home we went through Orlando which has no coastline, but it does have many bodies of waters, lakes and ponds, and what appear to be large man-made lagoons with regular shapes. The cliché is “water water everywhere and not a drop to drink” and I couldn’t help wondering how much of the water below us was drinkable. The December issue of Smithsonian magazine in my lap told the story of how the drinking water in Flint, Michigan was revealed as having poisonous levels of lead and how difficult it had been to get the problem recognized and how expensive it will be to correct it. The story about Flint ended with the information that in 2016 the Natural Resources Defense Council identified 5300 water systems in the U.S. that do not comply with federal lead standards. We are fortunate that here in Massachusetts we have close oversight of our water systems. I am proud to say that my daughter, Doctor Betsy as she is known in the family, is responsible for tracking the water quality of the Quabbin Reservoir, and the underground Norumbega Storage Facility which is located northeast of Worcester which supply water for the 61 communities served by the Massachusetts Water Resources Authority. Here in Greenfield we can be grateful that the Water Distribution and Water Facilities Divisions of the DPW monitor our water, and the infrastructure of the water system. They make all the information about the water and system online where it is easy to see that we are in compliance with all regulations. The website also includes contact information if we need a (free) water analysis or have questions. As I prepare the holiday feasts I am grateful for the gift of clean water. In this holy season I send you all my wishes for a healthy and joyous year. Reflections on The Worst Yet! 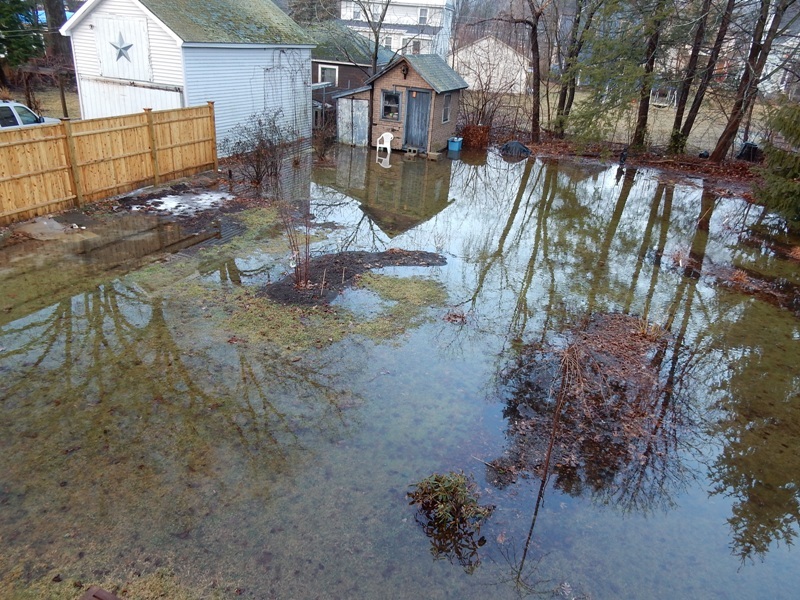 Well, after heavy rains all day yesterday, and possibly still frozen ground, this is the worst flooding yet. The reflections in the water which covers most of the yard are quite lovely in their own right, but they also make it clear where the high spots and low spots are. 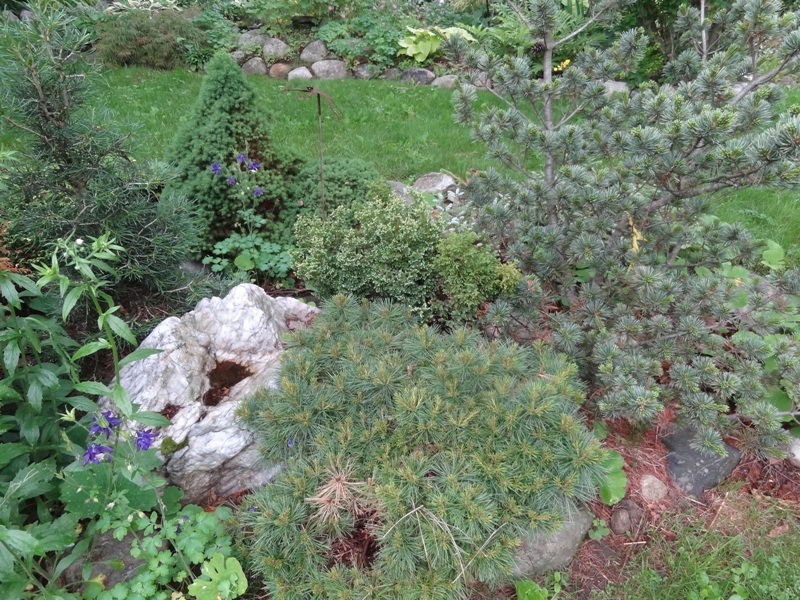 I know the winterberries, river birch, button bush, yellow twig dogwood, Siberian irises, chelone and other plants are still happy enough, but I am not so sure about the rhododendron or mountain laurel. As Krishna reflects on these reflections he remains unperturbed. For years putting water in the garden was a problem for me. Beverley Nichols was one of my favorite authors when I was younger and spent a lot of time reading English garden books. He is wonderfully witty (the British are never merely funny) and I can certainly identify with many of his adventures with plants, and other gardeners. I did take against one thing he said with great energy which was that a good garden required water. 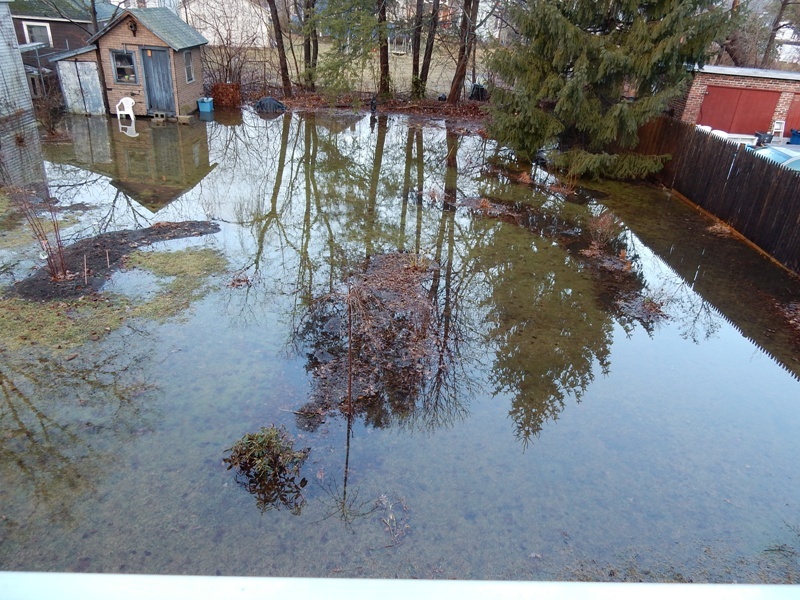 How the heck was I supposed to get water into my garden? All I could manage was a birdbath and I didn’t think that counted. In my defense I have to say this was before the advent of solar powered fountain pumps, and electric recycling pumps that came with the fountain urns sold in every garden center. 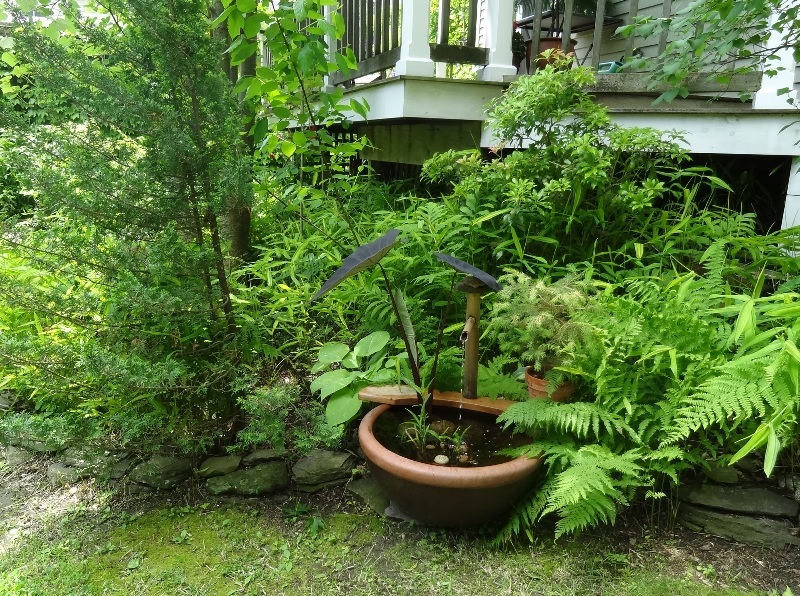 Three years ago, in lieu of buying a whole fountain with urn, reservoir and recycling pump, I bought a little fountain setup with some bamboo that rested across a small livestock waterer and a recycling pump that sat inside the waterer. I thought the bamboo made it look serenely Asian. (We all do have our fantasies.) I placed it on the Welcoming Platform next to our piazza where we sit in the shade of the wisteria to eat or just to relax and enjoy the view. I surrounded the not very attractive black water basin with potted plants and hid the electric cord almost invisibly. The day was fine and sunny. I took my book, about American gardens, out to the piazza, plugged the fountain into an outlet in the wall near the door, sat and waited. What I really wanted from my fountain was the burble of falling water. I could hear only the slightest sigh from fountain. What was wrong? My husband came home and we fiddled with the depth of the water, the fall of the water into the basin but nothing made much difference to me. Why not? Well, the problem was my ears. They just were not working as they had 20 years earlier. It then occurred to me I hadn’t been hearing the birds as much as I used to either. Something had to be done and I did it. I now have almost invisible (not that I care) bits of silver in my ears that help me hear the birds, but my little bamboo fountain never burbled sufficiently. A friend gave me a wonderful bird bath that we put in front of the piazza. It had a solar pump that sent the water splashing and that was lovely. But the pump died and I could never find a suitable replacement pump. Now the birds on our hill have still water awaiting them, but birders tell me that it is the sound of moving water that most dependably attracts birds. Over the years I have had the pleasure of being invited into many gardens and many of those gardens have had water. 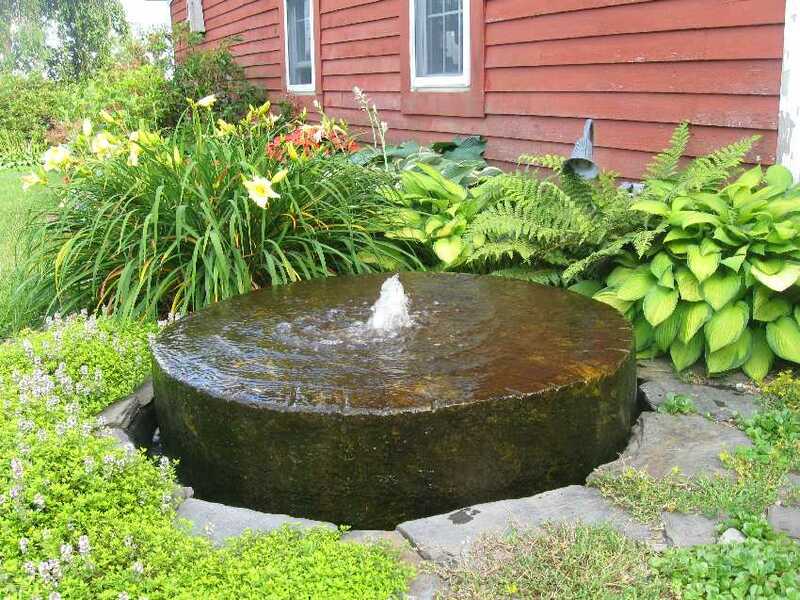 Jane Markoski has a fountain made of an old millstone, but she also has a lotus pond. The water is still but the lotuses, holding their heads above the water are magnificent. 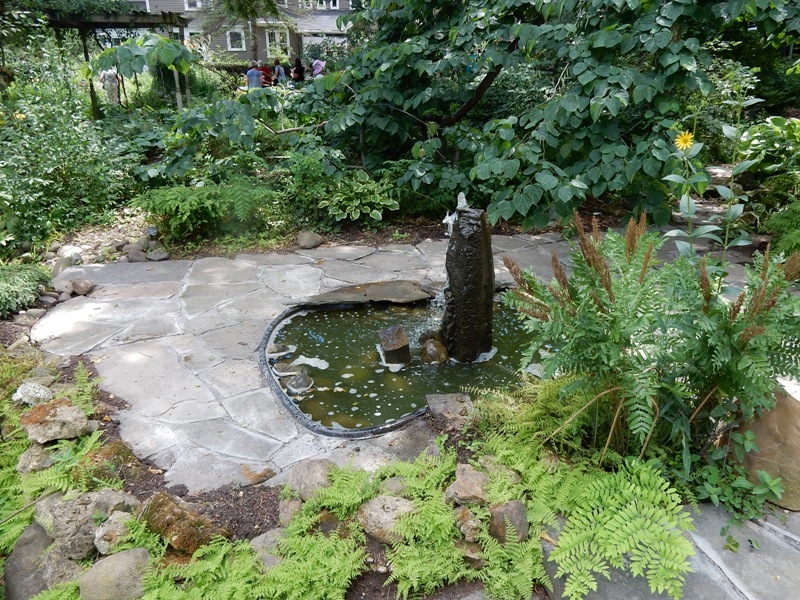 Rose Deskavich has a burbling fountain in her front yard, and a bit of woman-made stream with pool and a spouting splashing fountain in her backyard. Except for the fountain spout in the pool I thought it was a natural stream, and thought she was awfully lucky to have a stream emerge from her property line the way it did. Deskavich laughed at me when I exclaimed at her good fortune, but my husband now merely rolls his eyes and thinks I am the most gullible person he has ever met. But I digress. Other gardens have bowls of water in the sun or in the shade, resting on the ground or supported by handsome columns, but always surrounded by shrubs or trees so that birds stopping by for a drink or a quick bath can also find quick shelter if they suddenly feel threatened. 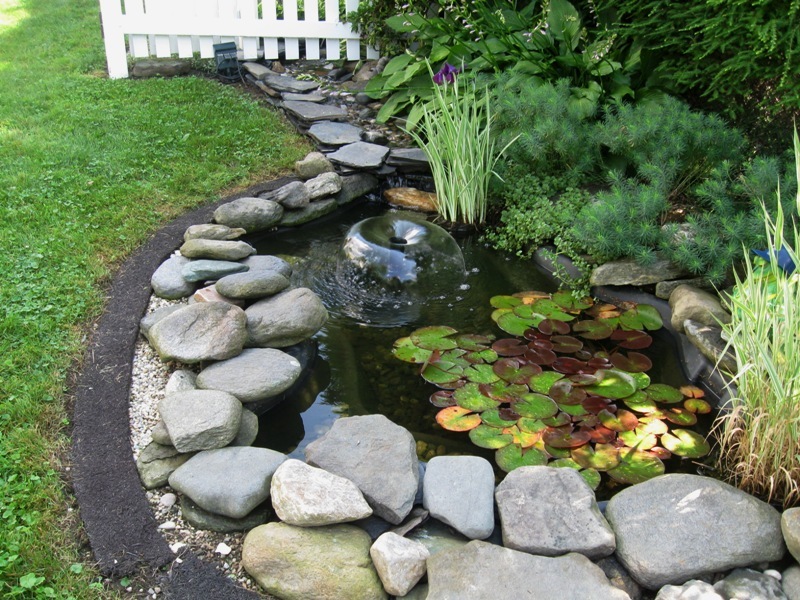 Whether you have a stream or a pond or a small birdbath, it is possible to have water in the garden and it all counts. The good news is that solar or electrical fountains on any scale from small to grand, are now available in garden centers. When I attended the February New England Grows exhibits in Boston there were booths filled with fountains of every type. There were splashing fountains and silent fountains where water slid down stone plinths, or granite balls resting on a plinth, or large stone bowls resting on a plinth. Our own Bridge of Flowers has a silent fountain in the shade that I call the Stone Spring. 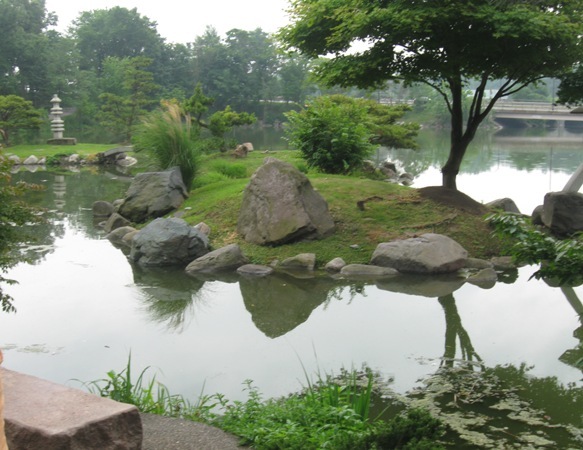 A beautiful boulder that is set on river stones has been slightly hollowed so that water collects and then silently slips over the edge into the reservoir where it is recirculated, setting the mood for contemplation after the riotous color of the sunny Bridge of Flowers. And fortunately for people such as myself, beautiful or amusing birdbaths are still easy to find in garden centers. Do you have water in your garden? What is it that you most enjoy? 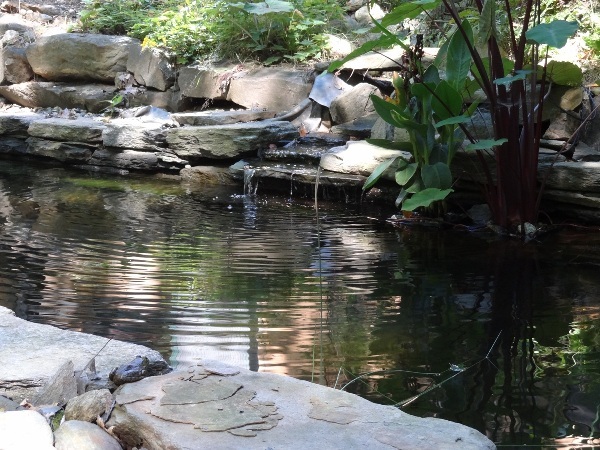 The sound of moving water, or the way water attracts birds and butterflies to your garden? 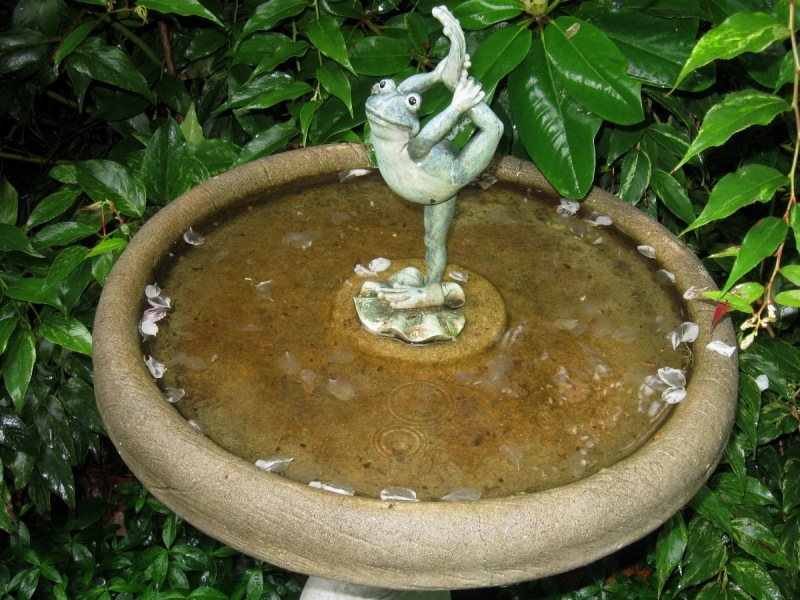 Does your fountain or birdbath serve as a work of art? I would love to hear about the water in your garden. You can email me at commonweeder@gmail.com. 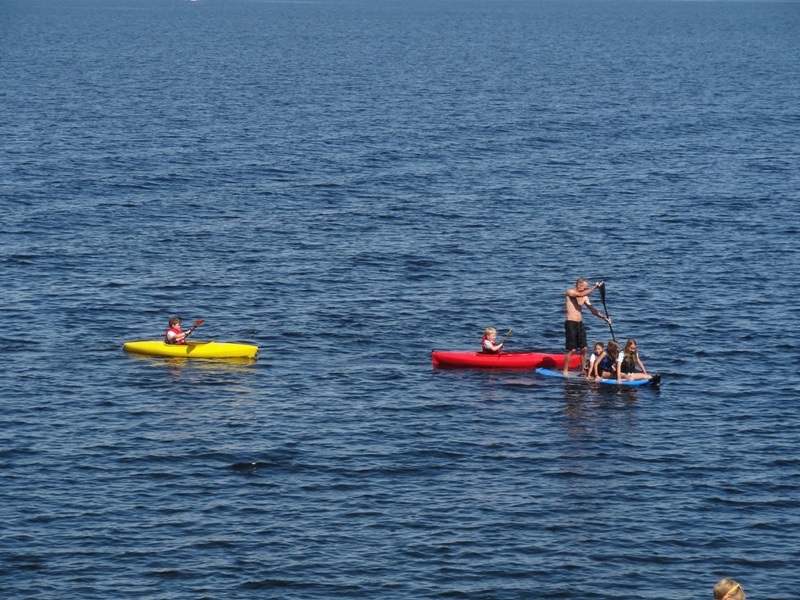 paddling peacefully on Lake Champlain. For more Wordlessness this Wednesday click here. 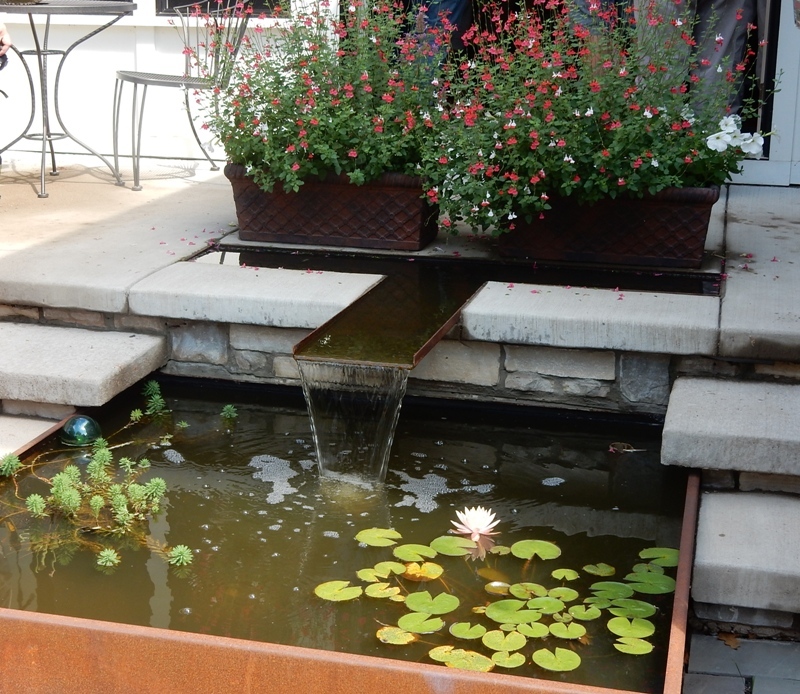 Water is an essential garden feature. 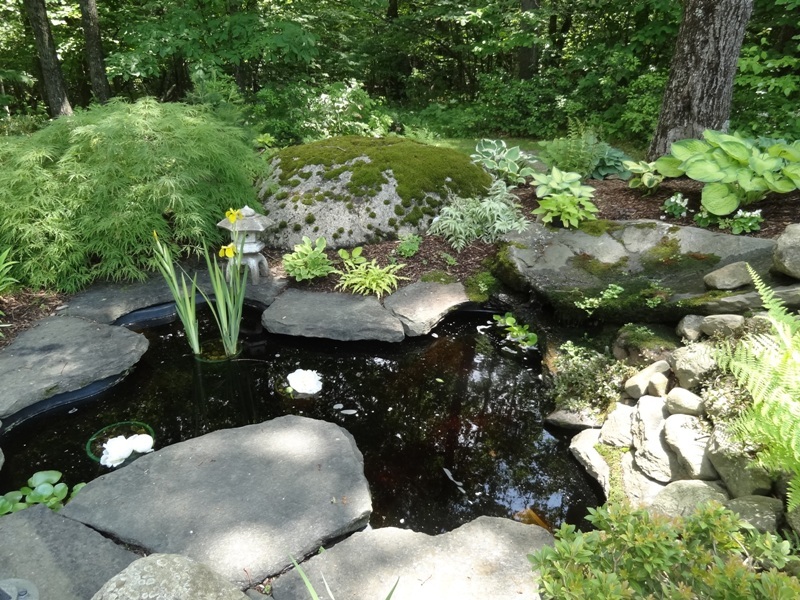 It can be elaborate like this shady stone stream that empties into a stone pond. It can be in a Japanese plantscape with a fountain. 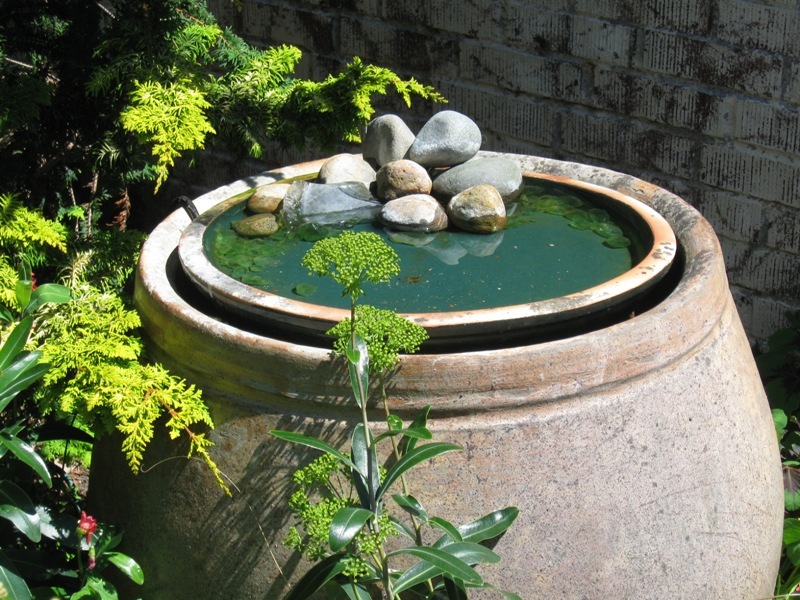 A large pot with a circulating pump can be transformed into a shady water garden. Sometimes water can just be captured in the concavity of a stone. 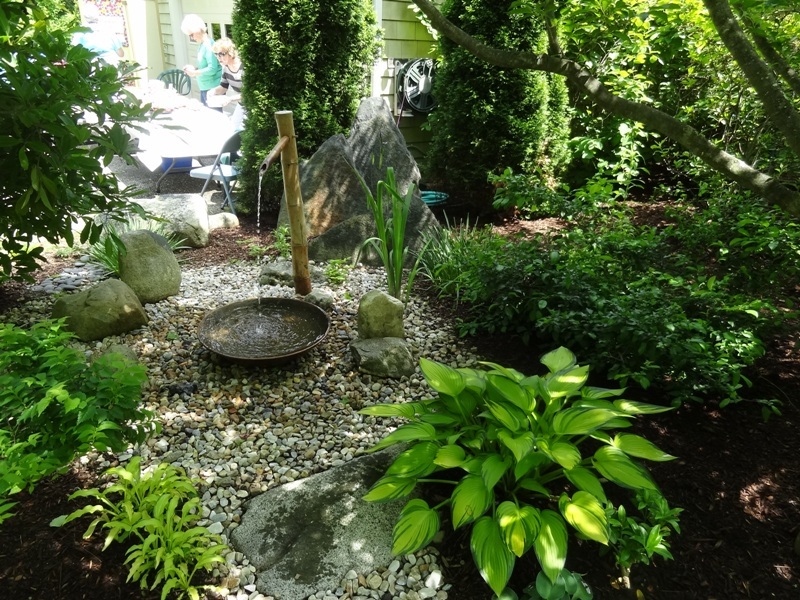 Does your garden have water? 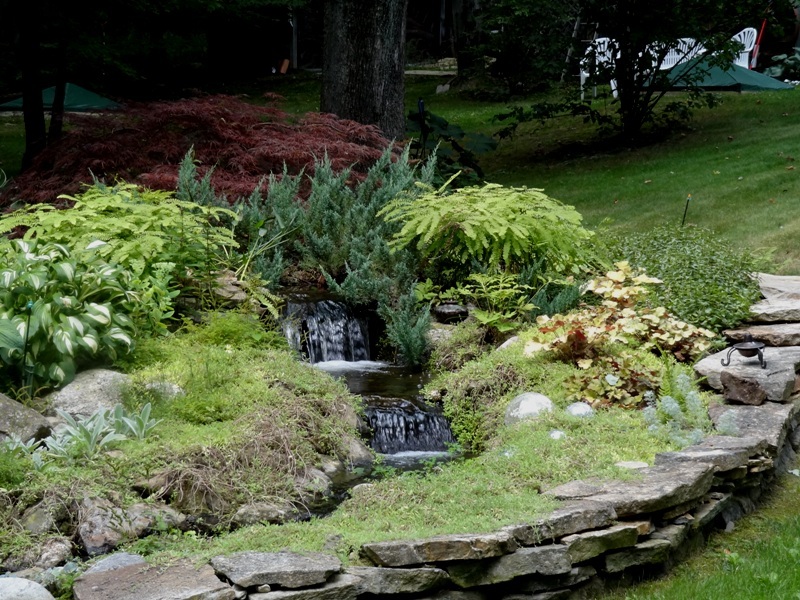 How can you create a water feature? What is a mystery melt? Yesterday morning we had snow showers, and cold temperatures all afternoon. 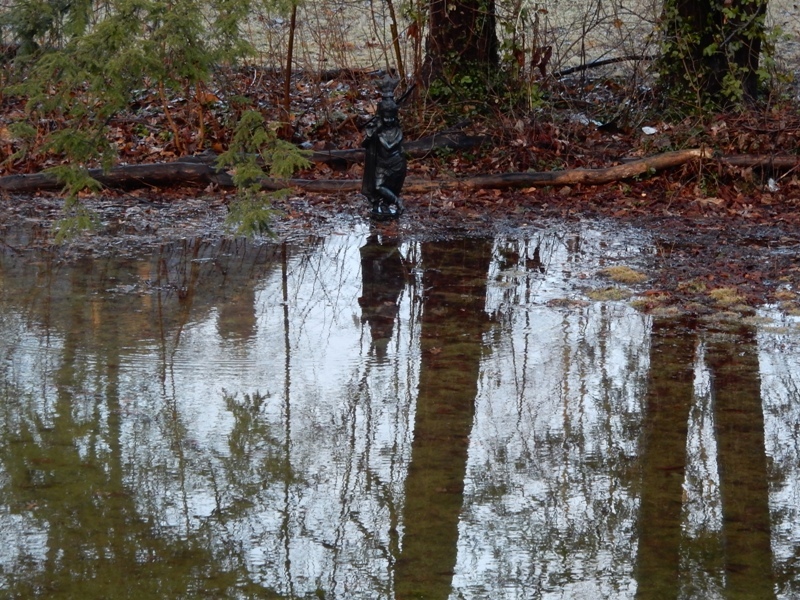 When I went out to the henhouse I noticed this mystery melt that ran from the top of the slope towards our wellhead. 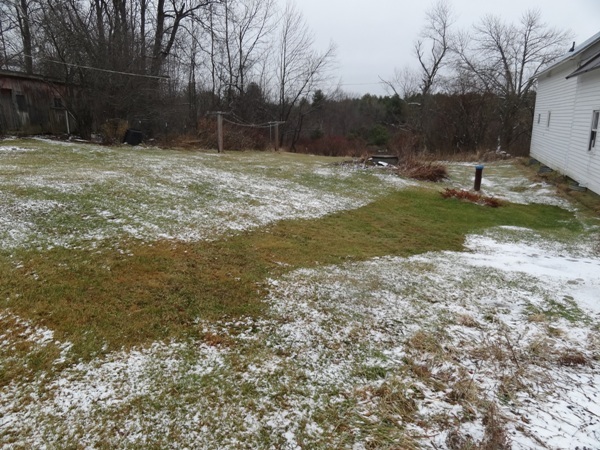 I thought it was so strange to have such a clearly demarked area when the cold temperatures kept the veil of snow intact everywhere else. We have a lot of water on our hill with intermittent streams that have created paths of water/damp loving sedges in our fields. There is a dug well up in the field, a 30 foot dug well lined with stone (an artful marvel of engineering) in back of the house near our drilled well, and a shallow dug well in the North Lawn Bed. The Sunken Garden is nearly a swimming pool from spring into mid-summer. Water comes coursing into our basement – and out through a conduit and onto the road. Water everywhere. Thinking about all the water on our hill showed I was on the right track. When I showed this to my husband Henry at the end of the day, he didn’t think it was a river or stream, but a spring not far below the surface. The area has always been wet. Then when we had work done on our foundation a few years ago our construction guy was moving soil around behind the house. Henry pointed out that the shape of this melt looked a lot like a bulldozer scrape. The spring was then just a little closer to the surface. It’s possible. What do you think. Why Does Snow Melt the Way It Does? “I’m a designer. I’ve always been absorbed by fashion, interior and landscape design,” Marie Stella said when she began my tour of Beaver Lodge in Ashfield. Her current and ongoing design project is the landscape surrounding her beautiful house which has been give a Platinum LEED (Leadership in Energy and Environmental Design) rating. This is very unusual for a residence. LEED designations require that materials be as local as possible, that recycled materials be used when possible. For example, at Beaver Lodge floors are made with wood from trees removed from the site. Stella touched on many other examples as we walked. Since her house has been designed with energy efficiency and environmental concerns in mind, it is no surprise that the limited domestic landscape shares these design constraints. 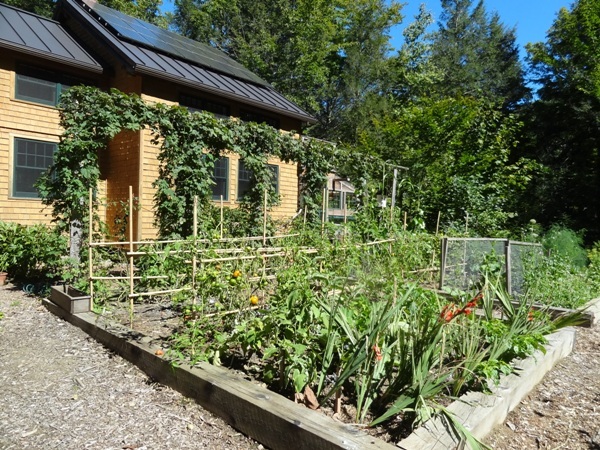 The garden is designed on permaculture principles with a large emphasis on edibles. The first notable aspect of the garden that stretches to the south, in front of the house is the absence of lawn. In the center are large raised vegetable beds, with perennial crops like asparagus, rhubarb, blueberries, raspberries and dwarf fruit trees along the eastern border. A small new collection of shitake mushroom logs rests in the shade of the woods. The western border includes a grapevine covered arbor furnished with a rustic table and benches to provide a shady resting space,. Closer to the house a wild garden filled with native pollinator plants nestles against the broad Ashfield stone terrace that is the transition between the garden and the house. Instead of grass, woodchips carpet the ground. This relatively small cultivated space is held in the embrace of a mixed woodland. To the north of the house is an old beaver pond which gives its name to Stella’s model house and landscape. In addition to being a designer, Stella is a teacher, and she has designed Beaver Lodge as a teaching tool,. She gives classes at the Landscape Institute at Boston Architecture College, and online. She did not begin her career as a teacher, and gardening was only an avocation. However, 25 years or so ago, when her children were young, she took a couple of Elsa Bakalar’s garden classes at her house here in Heath. She found those so inspiring she was led to a course in plant materials at the Radcliff Institute in Boston. That was so engaging that she went on to complete the certification program, and then another one. During those Radcliff classes she realized a new future was waiting for her. She could combine her earlier background as a historian with her interest in the landscape. She liked writing. Soon she was writing and lecturing about landscape history. 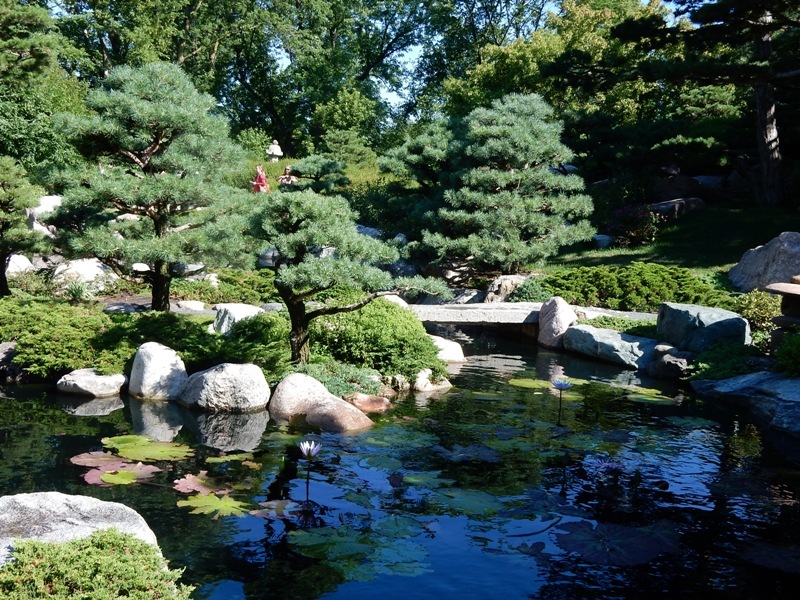 She organized and led garden tours to Japan and Italy. 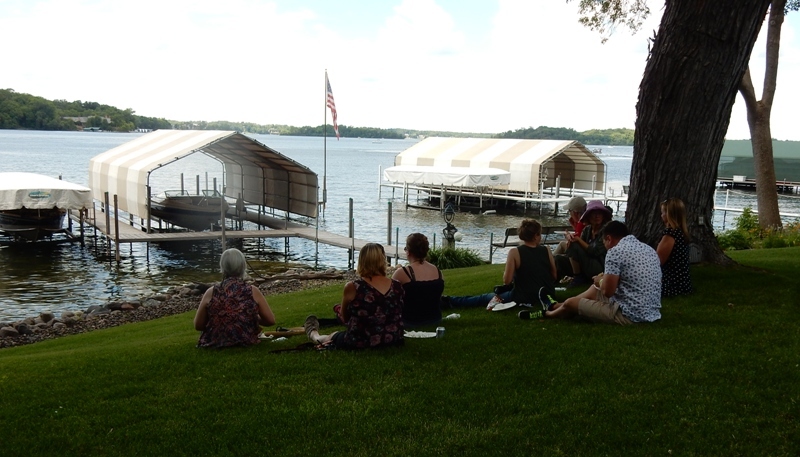 As fascinated as she has been with the history of the landscape, she began to look towards the future, and so came about the construction of Beaver Lodge which will be part of the free NESEA Green Buildings Open House Tour. Of course, Stella realizes that if you have a vegetable garden it must be watered. I was very impressed with the systems she has in place to supply adequate water to the edible gardens. At one end of the house the rain gutters bring water to a large stone retention pond that serves an important function, but is also beautiful since it is constructed of stone blasted from construction of the house. A pump brings water up to the vegetable garden when it is needed. She has added a bit of whimsy as well. 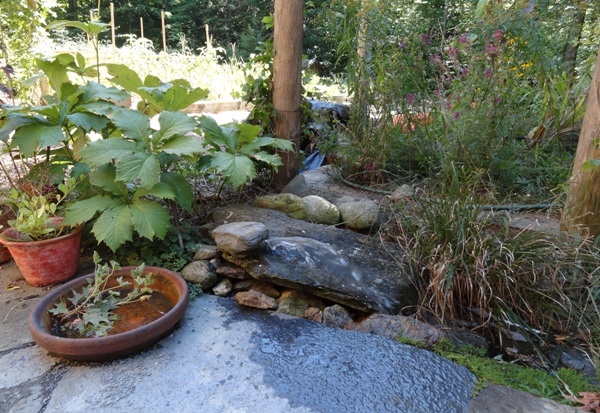 She has created a small fountain that uses water from the retention pond, and then brings it back to the pond down a created stream bed. 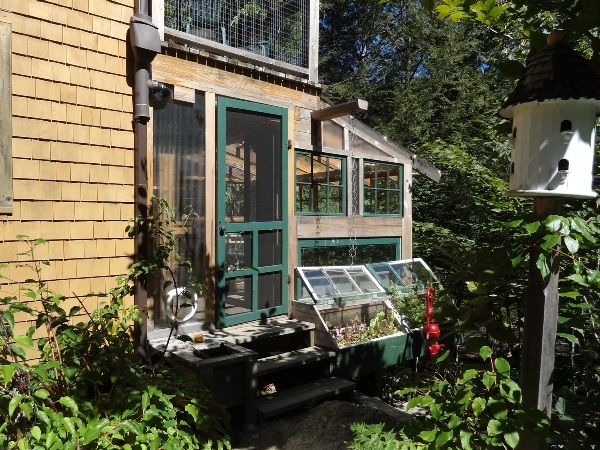 Since I visited last in 2009, Stella has added a small greenhouse that incorporates a cold frame and makes use of recycled windows. 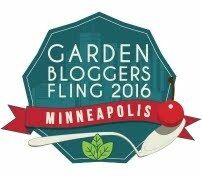 The greenhouse will give her a chance to get seedlings started early. Inside the greenhouse is a 550 gallon food grade plastic cistern that collects rain from the gutters at the end of then, and then pipes it into the garden. She also has a root cellar where she can overwinter bulbs and tubers. 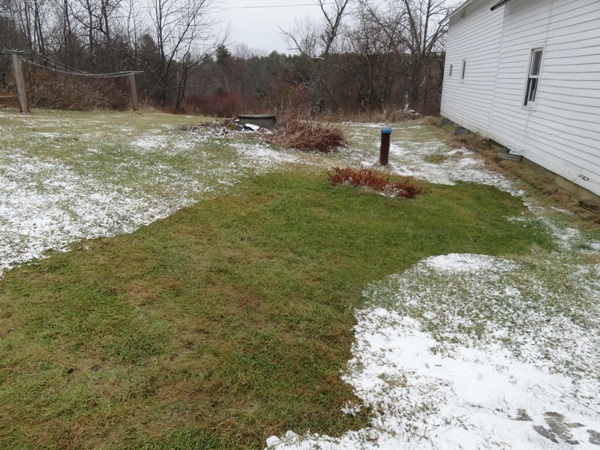 The constraint for other uses is that snow build up in often prevents access during the winter. Shakespeare once penned the line “Sermons in stones and good in everything . . .” Those who study and visit Beaver Lodge will find encyclopedias of good knowledge in this living lesson book. For information on visiting Beaver Lodge and all the sites on the Green Buildings Open House Tour on Saturday, October 5 you can go to the NESEA (Northeast Sustainable Energy Association) website, www.NESEA.org, and click on the Green Buildings Open House button. There you will be able to put in your own zip code and the distance you are willing to drive. Over 200 houses are on the tour in the whole northeast from Maine to Pennsylvania, but 37 house are within 30 miles of Greenfield. Several are in Greenfield itself with others in Montague, Colrain, Northfield, and South Deerfield, in addition to Beaver Lodge. The website will give you information about each house and it’s green elements, along with cost, benefits, and suppliers. The tour is free, but you should sign up.